Looking to the Future with Enova Women’s Networking Group - Enova International, Inc. 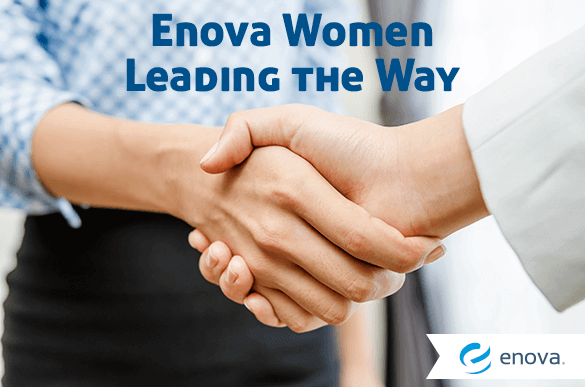 There are a number of programs, services and groups within the walls of Enova built to help employees reach their full potential, and one of the newest Enova organizations is the Enova Women’s Networking Group. While not exclusive to women, the group was created with a focus on the unique challenges women can face on the job, or even in the world at large. The primary goals of the Enova Women’s Networking Group are to address issues that are specific to women in the workplace, provide women the resources and support to develop their leadership skills, and network with other like-minded individuals across this organization and others. The group meets one to two times a month, and spends its time covering a variety of topics, such as self-promotion in the workplace, or finding a balance between success and likeability as a female leader. To enrich these discussion topics, the group invites guest speakers to contribute their words of wisdom. Recently, guest speaker Kim Feil was brought in to address leadership and peer mentoring, and discussed her time as the Chief Marketing and Strategy Officer for both OfficeMax and Walgreens. With her impressive resume, leadership acumen and unique point of view, Feil provided her audience with an array of practical advice. While the group is still in the early stages, it has already achieved a degree of success that keeps attendees excited about the future. In addition to more onsite events, group outings and outreach projects are scheduled for the future, and with a strong core of talented, thoughtful Enova leaders, the possibilities for the Enova Women’s Networking Group are limitless.